At Imbolg, the Maiden aspect of the Goddess might be represented in a great variety of ways -- by a simple ear of dried corn, a figure made of grain at Lughnasadh, or straws or wheat braided into an intricate design. 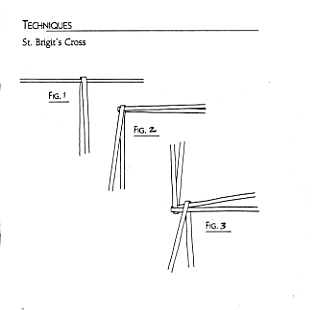 One representation of the Goddess is Brigid's Cross. Although the original design may well have been made from rushes, wheat versions have been recreated for centuries. Make a cross for each room in the house to invite the blessings of the Goddess into them. Soak straws in a tub of cool water for half an hour before starting, then wrap in a towel for another 15 minutes. Turn the straws 90 degrees counterclockwise again. Add the next straw by placing it to the right of the vertical folded straw and under the horizontal folded straw, as shown in Fig. 3. Fold the added straw, turn the straws once again, and add the fourth and final straw to this round in the same fashion. Continue to add folded straws. Avoid letting them bunch up or lie on top of those in a previous round. Instead, build the weave outward, resting the straws side by side. At first, you may find it difficult to hold the arms together and at right angles, but as the weave gains substance, this will prove easier. Just remember to watch for gaps and fill them by repositioning and tightening the straws as necessary. When all 28 straws have been incorporated, tie each arm off about 4 inches from the center of the design. Trim the ends of the straws and threads. 1. Soak straws in a tub of cool water for half an hour before starting, then wrap in a towel for another 15 minutes. 3. Bring it up and over to be alongside the two at the nest corner. We welcome in the Goddess and seek the turning of the wheel away from winter and into spring. Great Lady, enter with the sun and watch over this room! As over our home you extend your blessing.